One P.E. teacher called recess before Playworks, "a tornado, a hurricane, and a tsunami wrapped up as one." When P.E. teacher Hannah Reinke found out that her students at Antioch Middle School in Nashville, Tennessee would get daily recess, she was thrilled. Then reality hit. Last year, Antioch Middle School borrowed time from other periods to give students recess for the first time. Seven teachers, including Reinke, were charged with leading a recess break for each grade. “We let them all out on the football field, gave them a couple balls, and said, ‘go ahead, good luck!’ It was a tornado, a hurricane, and a tsunami wrapped up as one,” Reinke says. Reinke reached out to everyone she could think of for help, from other schools to the district’s school health coordinator, but she came up dry. “Everyone was trying to address the same issue at the same time,” she says. 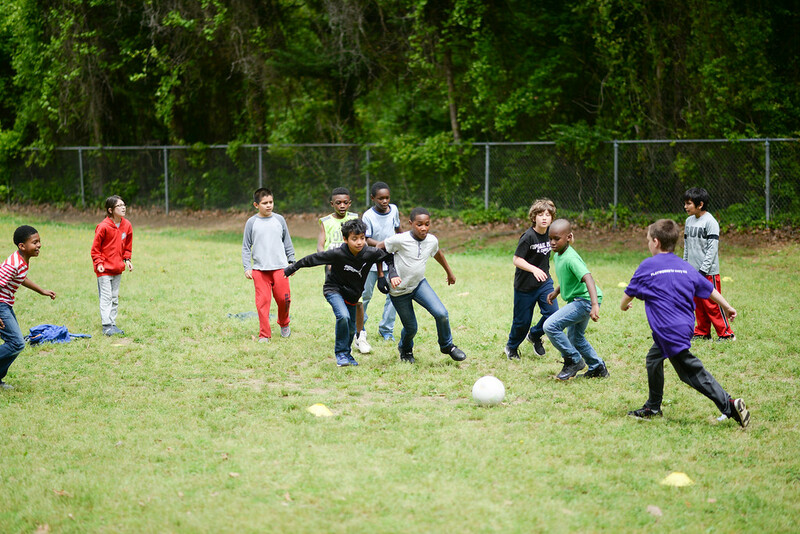 This summer, Tennessee passed statewide legislation requiring longer recess breaks. Nashville Metro Public Schools increased break time requirements last year, so schools like Antioch are leading the way for the state. Eventually, Reinke googled “recess help” and stumbled upon Playworks. Her team began using the Playworks game guide, which explains how to play hundreds of games. Last year, we would blow the whistle to dismiss and fights would break out on the way back into class. Teachers hated it as much as we did. While the games were helpful, Reinke knew she needed help to create a strategy that would get recess chaos in check. A Playworks Pro training seemed like the best solution, and Antioch’s Principal Ceilia Conley saw the need. Playworks Trainer Sean Keelan lead a two-day training at Antioch this summer. Keelan worked with Reinke’s team to come up with a recess plan. He taught new games and helped the team work out facilities challenges, rotations, and logistics. The first challenge was to design a space that supports play. The team painted three foursquare courts, put up basketball hoops, and plan to add tetherball next. Next, the team introduced a new equipment strategy, providing only the supplies needed for each game. “Because we have just the equipment needed and nothing extra, we no longer have balls flying everywhere and people getting hurt,” explains Reinke. Middle school teachers don’t typically find recess enjoyable. It’s not what they signed up for. Now, my teachers love it. Finally, an all-staff training introduced tools that teachers now use school-wide, like playing rock-paper-scissors for conflict resolution. Simple strategies like these make a big difference. Principal Conley agrees. Before, she noticed that many students seemed ambivalent about recess. Now, they report that recess is their favorite activity. The biggest difference is the decrease in conflict spilling from recess into the classroom. “Last year, we would blow the whistle to dismiss and fights would break out on the way back into class. Teachers hated it as much as we did. Now, they don’t have to deal with those conflicts,” says Reinke. This year, with Playworks strategies in place, it was two months before the school had an altercation. “Middle school teachers don’t typically find recess enjoyable. It’s not what they signed up for. Now, my teachers love it.” said Conley. Recess went from being one of the most dreaded parts of the day to one of the most loved—by everyone. Reinke is grateful that recess is finally serving the role she always thought it could, and that it shows. Curious About Your Recess Opportunities? Big changes start small. We’d like to help! Get started with a free recess consultation.